The steel base material has a G-90 hot dip zinc coating, galvanized by a process developed especially for powder coating. Electrostatic application of the PermacoatTM powder coating system results in coated surfaces with unmatched performance. The base coat of epoxy powder far surpasses the corrosion resisting abilities of painted surfaces. 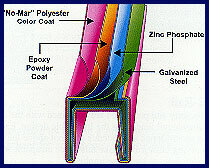 The "no-mar" polyester powder top coat reduces scratches and burnishing marks normally encountered during shipping. AEGIS II -- A revolutionary system of fencing posts, framework and mounting accessories that are easily assembled to form an attractive "good neighbor" appearance with no exposed fasteners. 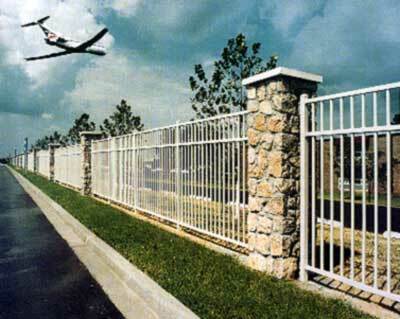 Aegis II TM is the strongest ornamental component fence system available. Superior vertical and horizontal load capacities with all-steel framework and specially designed ForerunnerTM Rail. No external fasteners resulting in increased security and strength. Special one-way security fastener for rail-to-bracket connection. Internal retaining rod for picket-to-rail connection cannot be breached when panel is in place. Due to the unique patented design using high technology roll form equipment (in-house tube mill), Ameristar is able to supply an affordable ornamental fence as a welcome alternative to chain link fencing. G-90 galvanized steel resulting in superior rust protection. Maintenance free PermacoatTM (double layer) powder coat system. Architecturally pleasing free flowing lines with no external fasteners. Visually reflects strength, security and beauty. Offered in four colors - Black, Bronze, Desert Sand or White. Available in a variety of popular styles in both two and three rail designs.